Sticky buns have been one of our favorite desserts for ages. We’ve had them from a delicious place at the beach, local bakeries after Sunday church, and grilled and then topped with ice cream at Penn State. That’s a pretty delicious way to eat them, but we only have had “grilled stickies” a couple times because we don’t live around there (some relatives do). How can anyone resist the tender dough rolled up with cinnamon sugar and then topped with a gooey, caramel-like sauce? We can’t! Luckily, our dad loves them as much as we do so he fully supported them being his father’s day treat. We actually ended up making them the day after because 1) our grandparents were coming over for lunch on Sunday so we didn’t really have time and 2) our youngest brother Henry, who’s 7, ended up in the ER after running into a plate (?) and getting a bad cut. It wasn’t really the best father’s day for our dad! Hopefully these homemade sticky buns made up for it! They were soft, sticky (of course), sweet, and buttery. 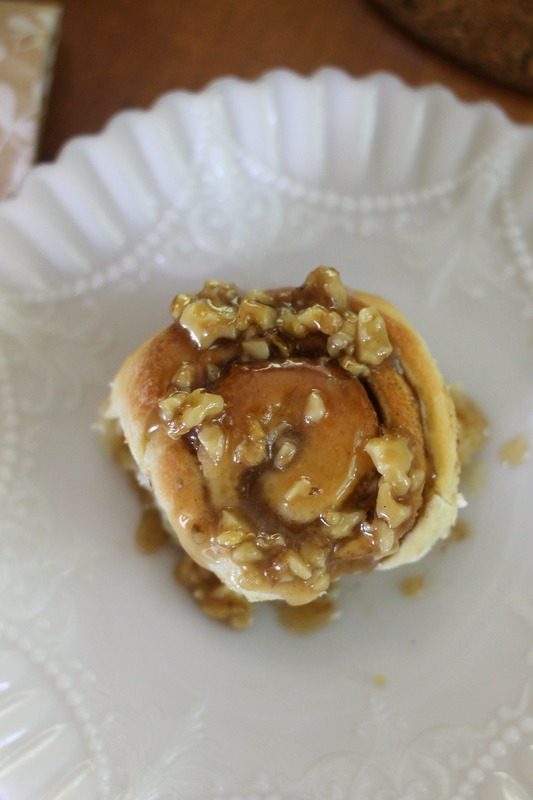 They were perfect, and I doubt we will ever try another sticky bun recipe! The recipe looks like it has a lot of steps, but everything is pretty easy. 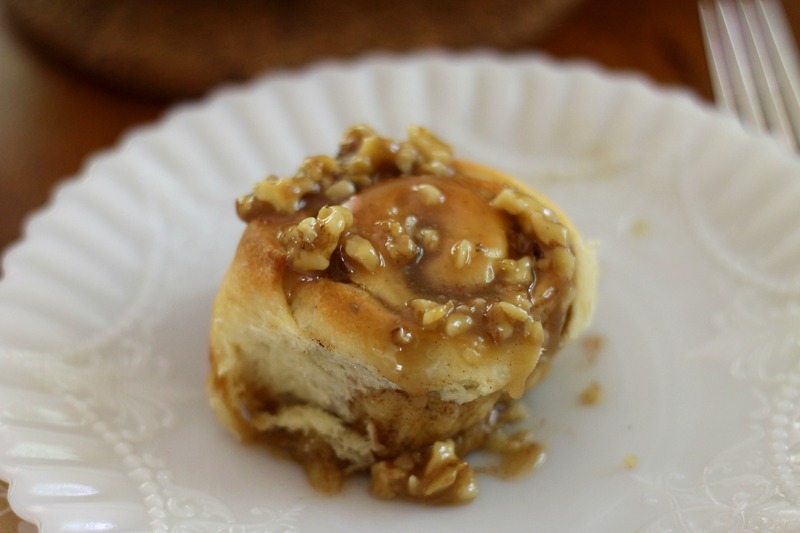 The topping is addictive and can be made with either walnuts or pecans. Either way is delicious! By the way, I have a feeling the topping would be excellent on top of some vanilla ice cream. That reminds me, we really need to post a few ice cream recipes soon, because before we know it, the summer will have flown by! In bowl of standing mixer, whisk eggs to combine; add buttermilk and whisk to combine. Whisk in sugar, salt, and yeast. Add about 2 cups flour and butter; stir with wooden spoon or rubber spatula until evenly moistened and combined. Add all but about 1/4 cup remaining flour and knead with dough hook at low speed 5 minutes. Check consistency of dough (dough should feel soft and moist but should not be wet and sticky; add more flour, if necessary); knead at low speed 5 minutes longer (dough should clear sides of bowl but stick to bottom). Turn dough out onto lightly floured work surface; knead by hand about 1 minute to ensure that dough is uniform (dough should not stick to work surface during hand kneading; if it does stick, knead in additional flour 1 tablespoon at a time. We ended up adding additional flour). Lightly spray large bowl with nonstick cooking spray. Transfer dough to bowl, spray dough lightly with cooking spray, then cover bowl tightly with plastic wrap and set in warm, draft free spot until doubled in volume, 2 to 2 1/2 hours. Meanwhile, combine all ingredients for glaze in small saucepan; cook over medium heat, whisking occasionally, until butter is melted and mixture is thoroughly combined. Pour mixture into nonstick metal 13- by9-inch baking dish; using rubber spatula, spread mixture to cover surface of baking dish. Set baking dish aside. For filling, combine brown sugar, cinnamon, cloves, and salt in small bowl and mix until thoroughly combined, using fingers to break up sugar lumps; set aside. Turn dough out onto lightly floured work surface. Gently shape dough into rough rectangle with long side nearest you. Lightly flour dough and roll to 16 by 12-inch rectangle. Brush dough with 1 tablespoon melted butter, leaving 1/2-inch border along top edge; with butter remaining on brush, brush sides of baking dish. Sprinkle filling mixture over dough, leaving 3/4-inch border along top edge; smooth filling in even layer with hand, then gently press mixture into dough to adhere. Beginning with long edge nearest you, roll dough into taut cylinder. Firmly pinch seam to seal and roll cylinder seam side down. Very gently stretch to cylinder of even diameter and 18-inch length; push ends in to create even thickness. Using serrated knife and gentle sawing motion, slice cylinder in half, then slice each half in half again to create evenly sized quarters. Slice each quarter evenly into thirds, yielding 12 buns (or, like us, you can cut it into 16 pieces- we have 8 people in our family, and thought it would make more sense to divide the dough into an amount divisible by 8). Arrange buns cut side down in prepared baking dish; cover tightly with plastic wrap and set in warm, draft-free spot until puffy and pressed against one another, about 1 1/2 hours. To bake, adjust oven rack to middle position, place baking stone on rack, and heat oven to 350 degrees. Bake buns for 25-30 minutes. Cool on a wire rack for 10 minutes; invert onto rimmed baking sheet, large rectangular platter, or cutting board. With rubber spatula, scrape any glaze remaining in baking dish onto buns; let cool while making pecan topping. Note: we served ours straight out of the pan because we didn’t want to dirty another dish :). They should be delightful either way you serve them! Combine the butter, brown sugar, corn syrup, and salt in small saucepan and bring to simmer over medium heat, whisking occasionally to thoroughly combine. Off heat, stir in vanilla and pecans until pecans are evenly coated. Using soup spoon, spoon heaping tablespoon nuts and topping over center of each sticky bun. Continue to cool until sticky buns are warm, 15 to 20 minutes. 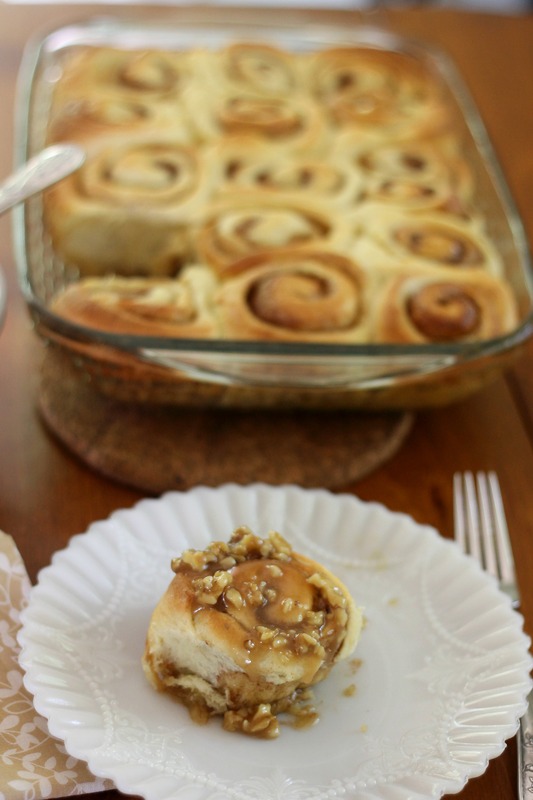 Pull apart or use serrated knife to cut apart sticky buns; serve. Oh my goodness these look to die for! Cinnamon buns with cream cheese icing are one of my favourite things to eat, but I’ve never tried Sticky buns before. This recipe looks like it may convert me! We love cinnamon buns too- we need to find a go-to recipe for them though! In our opinion, sticky buns are just as good as cinnamon buns because while cinnamon buns have cream cheese icing, these have caramel sauce (yum).